We are close to Bala Lake and Llangollen, 35 miles from Chester, just under one hour. 1½ hours from central Manchester and Liverpool and their airports. Nearest train station is Wrexham or Chester. There is a local bus service which is the X94 route from Wrexham to Barmouth, but it takes a while. Taxis can be arranged with good notice. London can be done within 3½ hours if you take the M6 toll road and the traffic is kind to you. Bryan and Susan Webb celebrated 15 years as custodians of Tyddyn Llan in 2017, and they remain as an impressive double act when it comes to warm-hearted hospitality – he cooks, while she takes care of front of house. The setting is a converted shooting lodge in the tranquil expanses of the Dee Valley – a civilised backdrop for some civilised dining. Bryan’s cooking acknowledges his Welsh roots, although the traditions of mainstream European cuisine provide a sturdy backbone for his gentle culinary talents. Expect clear flavours and thoughtful pairings across the board, from starters of dressed langoustine with avocado, fennel and radish to desserts such as pecan tart and baked Alaska. In between, there’s wild sea bass with laverbread beurre blanc, prized Welsh Black beef, roast turbot with leek risotto, and venison with goat’s cheese gnocchi, port and elderberry sauce. The Webb’s thoughtfully curated wine list is also the subject of much attention, with its ungreedy markups, helpful notes and 16-strong selection by the glass or carafe. ‘One comes for the food, and it doesn’t disappoint,’ reports a trusted Guide reader after a 2018 visit to Susan and Bryan Webb’s Michelin-starred restaurant-with-rooms in a ‘peaceful, rural location’. The ‘main event’ is served in dining rooms ‘where an air of quiet calm prevails’ with Bryan Webb’s menus exploiting seasonal Welsh produce, perhaps loin of venison with goat’s cheese gnocchi, port and elderberry sauce. ‘We had two excellent meals. Nothing complicated or pretentious. Turbot on leek risotto with red wine sauce was delicious and, at £55 for two courses, the meal was not overpriced.’ Service is ‘professional, friendly’. The other part of Tyddyn Llan’s formula is its ‘tastefully decorated, well-furnished, comfortable rooms’ with ‘uplifting’ contemporary hues and a ‘decent bathroom’, slightly let down by ‘captive coat hangers’ and ‘poor bedside lights’. Small niggles, however. Tyddyn Llan is run with aplomb by Susan Webb. ‘Madame is constantly watchful, ensuring everything is as it should be while giving guests her undivided attention. This is the French model, and a very good one.’ Breakfast with ‘decent’ coffee and ‘everything freshly cooked’ is ‘fine’. Bryan Webb has spent 40 years at the stove. ‘Not Bad For A Taff’ tells his remarkable story. From peeling potatoes, picking spinach and washing up at The Crown, at Whitebrook, to creating his Michelin-starred Tyddyn Llan, with his beloved wife, Susan, he has enjoyed a remarkable career. 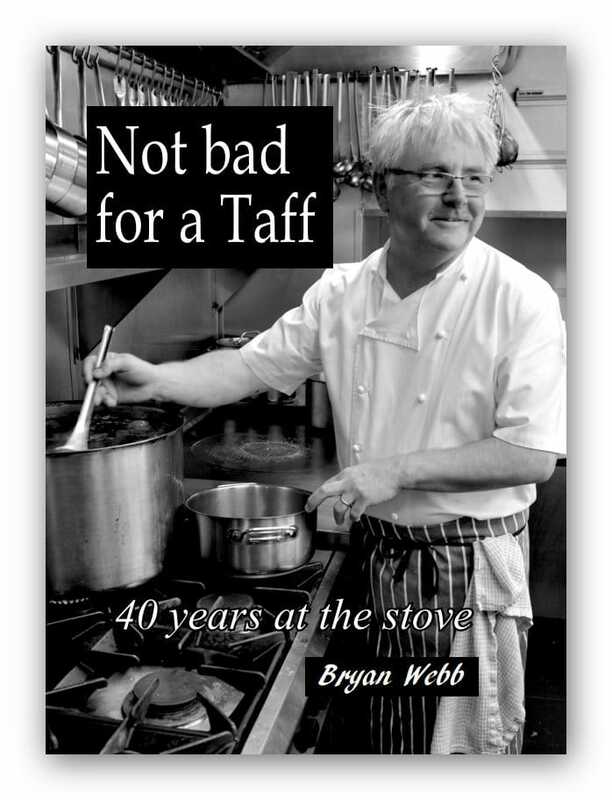 ‘Not Bad For A Taff’ is part autobiography, part rich collection of recipes. Bryan shares stories from his 40 years at the stove before sharing recipes from the 1970s to the present day. There are numerous classics, signature dishes and contemporary reinventions that showcase the best of seasonal ingredients. Sumptuously photographed and featuring dishes that will excite both the home cook and the professional chef, ‘Not Bad For A Taff’ is a fitting tribute to one of the titans of Welsh gastronomy. The book is published at £25. You can order copies from us, with FREE delivery. If you would like the book as a gift, we’re happy to send direct to the recipient, with a message from you. Bryan is happy to sign and dedicate books for you. Phone us, 01490 440264, or contact us via mail@tyddynllan.co.uk if you’d like one of the first copies. A wedding is a very personal and joyous occasion and a wonderful celebration of your new future, this event needs to be arranged with great care and attention to detail. Who better to look after you than Tyddyn Llan? Especially if you are looking for really good food and wines. We offer superior meeting facilities with all the usual services. The £180 24-hour rate offers accommodation, dinner, cooked breakfast, morning coffee, two-course lunch, afternoon tea and hire of a meeting room. Or our £45 Day Delegate Rate includes morning coffee, two-course lunch, afternoon tea and hire of meeting room. Contact us for more info. (Prices per delegate plus VAT).